A wireless repeater can help extend the range of your wireless network. 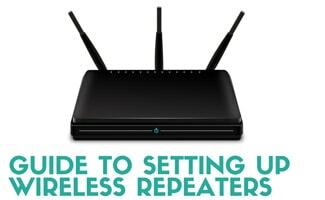 Typically, if you’re in a large house or office complex, you can use wireless repeaters to extend the reach of your wireless signal without buying expensive new routers. In this particular example, we will be using the Engenius ERB9250. Regardless of what the setup instructions say, the WPS “easy setup” mode is not easy. In fact, with most modern routers and network configurations, WPS is more of a pain than anything. So we’ll be skipping straight to manual setup and showing you how to set up your repeater. Would you prefer to have an expert help you out? Visit Best Buy’s GeekSquad website today. First, plug your repeater into the wall next to your PC with the supplied power cord, and connect the repeater to your PC’s Internet/LAN input (a broadband “phone jack” type plug that is wider than your phone plug connector”). In Windows 7 (the steps are similar for other operating systems. If you get stuck, please comment below and we’ll provide detailed instructions), type “Network and Sharing Center” into your Start Menu search box and hit enter. Leave DNS settings as is and save. Browse to the IP address of your repeater in a browser window (i.e. //192.168.1.2). Enter your wireless repeater user ID and password (usually admin/admin by default – you’ll want to change these once in). Enter the SSID that matches the name of your wireless network (we initially tried giving the repeater a unique name but couldn’t get it to connect). Select your network band (we recommend 2.4 GHz (B+G+N), where N allows speeds up to 300mbps or faster. Note that this repeater is not compatible with the newer 5 GHz band, available on dual band routers. You should see a message that you connected successfully. If not, see the troubleshooting section below. You can now move your wireless repeater to a location halfway between your router and your PC. Disconnect and re-connect to your wireless connection on your PC. You should notice a marked increase in connection speed. To ensure that your repeater is connecting at the fastest possible speed (300 Mbps and not 54 Mbps or lower), we recommend you connect to your repeater by typing “//192.168.1.2” into your web browser’s address bar and browsing to Wireless > Status. Make sure the “Data Rate” under “WLAN Repeater Information” is 300 Mbps. Next, right-click your wireless network (bottom right corner of your Windows desktop), select “Status,” and under “Connection” verify that you’re connected at a speed at or near 300 Mbps (actual number might be between 250-300, but shouldn’t fall below 200). If the “Data Rate” is showing as 54 Mbps or lower, browse to Wireless > Basic, click on “Site Survey” and try re-connecting to your network until it connects at the highest speed. Some useful tips if you can’t get this to work: try WPA2 (AES) instead of WPA (TKIP). Try disconnecting from your network entirely, then logging back on and repeating the steps above. If you still can’t connect at the highest speed, please comment below with details and we’ll try and troubleshoot your specific issue. If you are looking for a new router, read these WiFi Router and Extender Reviews. If you’re having trouble connecting in step 13) above, try naming the wireless repeater SSID to be the same name as your wireless network. If you’re experiencing any other problems, please comment below! What issues have you had while trying to connect your WiFi extender? Will this work on a totally Wireless system using Windows 10? If help before I return it suggesting it is just a waste of money. well, I’m at a loss. i don’t have an ethernet or LAN ports. so not sure how I can set it up period. i have 3 USB ports and 1 HDMI port. so not sure how to even go about setting these little bastards up… if can help email me, anyone. or even text me 240 447 1034 or hdcdpd@gmail.com…..names David. about to return this EZ setup device. lol. I have the wavlink-n. plus windows 10. plus dell Inspiron 13/7000 series. My repeater has an out of range address.. .0.1, not .1.1 or .1.2 etc. how do I configure it to work my network? U state in ur directions to change its IP to .1.100, subnet mask to 255.255.255.0 then change the default gateway address to .1.2 or whatever the repeater says it’s address is in its documentation.. mine says .0.1 which won’t work if I’m manually setting its ip up as .1.100. Anybody else run into this? How do I connect the wifi repeater to an iPhone or iPad? related to comfast CF-WR750AC., it connect to my 2,4 Ghz Ap however does not get IP(Acording to the manual the wan should get the ip assigned by the AP that we select to connect as client repeater. 1.Have you got such a post for WIN 10 ? I have read a lot of articles on the net about setting up a wireless repeater, but not one of them helped me except this one. Now my wireless repeater works. Thanks. I am getting really weird speed results. Whenever my wireless connection (in Windows 7, my repeater speed is listed as 300Mbps) is close to 300, I get an unbelievably slow upload speed (checked using BandwidthPlace.com) ~ 500 Kbps. To resolve this, I disable my wireless Internet connection (right-click and hit “disconnect”) and then re-connect. It connects at a much slower speed (when I check the “status” screen) ~ 100 Mbps, but when I check my speed it’s about 20-30 times faster (my fastest so far is 15 Mbps download speed – faster than the speedometer!) Weird, right? What the heck is going on? For me the key was selecting only the “N” Band (under Wireless > Basic). Ie. next to “Band:” I chose “2.4 Ghz N.” Although now that I look back at it, it’s set to “B+G+N.” Selecting just “N” was the only way I could see my network when I clicked “Site Survey.” Also, it appears that I needed to set the Repeater SSID the same as the router SSID, otherwise it wouldn’t find my wireless network (I tried setting the SSID to a new name within the repeater setting, and my PC/ network no longer found the repeater when I browsed to http://192.168.1.2, so I’m guessing the SSID’s need to match.